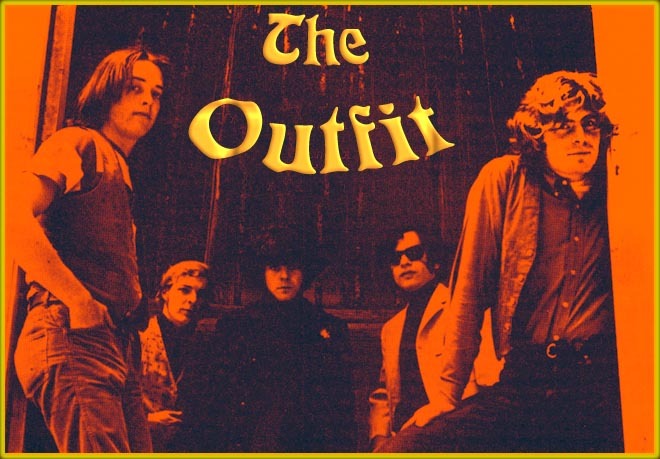 The Outfit were a San Francisco-based group of the mid-60’s. The band was founded in 1965 and the original line-up included Bob Harwayne on lead guitar, Cousin Robert Ressner on rhythm guitar, Johnny Ciambotti on bass and Steve Bonuccelli on drums. Bonuccelli remembers that the others were already professional hippies when he joined the band. They were pretty much into folk rock. Ciambotti had started his musical career in Los Angeles where he was a Spanish major at UCLA. One day, drunk as he was, he started singing with a band and as they liked his style he became their bass player. They called themselves Valley Boys and became well known around the LA bluegrass circuit. One day Ciambotti decided to move to San Francisco with it's flourishing music scene. He worked at a post office shortly and joined The Outfit as their electric bass player. The Outfit were doing original material from the beginning. They got their name in 1966. In the beginning they called themselves "Four Letter Outfit", but The Outfit was what people remembered. What people also remember is, that ex-Great Society bass player Bard Dupont became their manager. 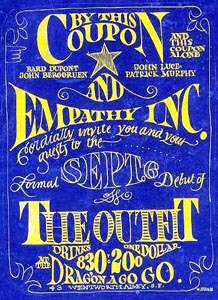 Actually, it was Bard Dupont, John Berggruen and Michele Sevryn, aka Empathy, Inc. who managed The Outfit - unsuccessfully. Jim Brown, Johnny Ciambotti, Steve Bonuccelli, Cousin Robert (late 1966) The Outfit's first gig was in April 1966 at the Matrix but the band wasn't a stable outfit yet. In May Bob Harwayne left the band due to his drug problems. The band rehearsed in the later legendary Straight Theatre, a place they shared with the Grateful Dead. Still short of a lead guitar player they had several replacments - a girl named Judy, a guy named Scratch and even David Miner, Bard's ex band mate who had just left the Great Society. All of them didn't last long and the band finally added Bobby Beausoleil as lead guitar player. Almost all lead vocals were done by Johnny Ciambotti before Win Hardy became their lead singer around July. Thus, the band (pictured above) had their first "stable" line-up. The band continued to rehearse - a mix of originals and covers and finally had their debut at the Dragon A Go-Go in September, 1966. Somehow the debut didn't bring the attention needed and instead Bobby Beausoleil got fired - as he cared more for the girls than he would for the band. He was soon replaced by Win Hardy's songwriter partner Jim Brown. 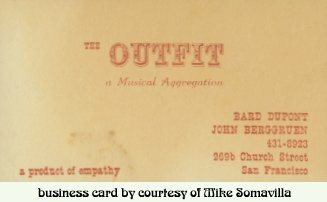 With this line-up The Outfit went into the Golden State Studios, San Francisco to record a demo with several original tunes written by Ciambotti, Brown and Cousin Robert. Around that time John Berggruen decided to withdraw his financial backing and when the money went, Win Hardy decided to leave too. Luckily the band found new financiers in Mark Slotkin and Loren Markin from LA and soon went down there and played places like the Whisky A Go Go. 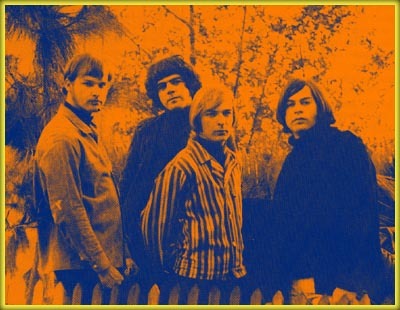 They also got another demo session at Sunset Sound Recorders, LA in December, 1966 - featuring Lowell George on flute. It looked like Columbia Records would sign the band but in the end Columbia lost interest when the band couldn't agree with the contract offered. Eventually the band returned to San Francisco, i.e. Muir Beach in Marin. The band would become one of the house bands at Muir Beach, i.e. the Muir Beach Tavern, alongside bands like The Flying Circus and The Tiny Hearing Aid Company. The Outfit finally disbanded in the middle of 1967 when Johnny Ciambotti decided to join forces with Alex Call, John McFee and Mitch Howie from The Tiny Hearing Aid Company to start Clover. Steve Bonuccelli would join the new Flying Circus, aka Circus. Love #1 -- Something Like This -- ??? and finally in 1969 ... "Charles Manson's right hand man"